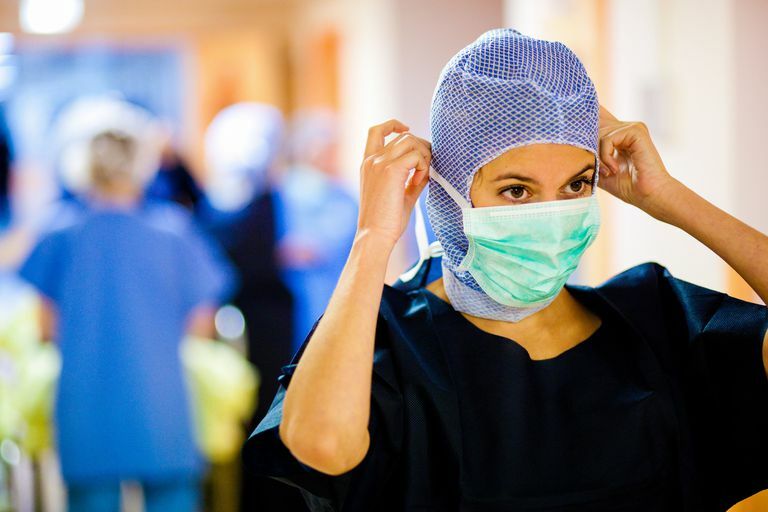 Personal protective equipment (PPE) is used by healthcare providers to protect themselves from injury or infection. There is personal protective equipment to keep rescuers safe from physical injuries, from chemical hazards, and from infection. Lay rescuers should follow their professional counterparts by practicing universal precautions and using PPE to provide protection from infection when assisting victims in an emergency. The best way to prevent the spread of disease is to wash hands with soap and warm water after every contact with a medical patient. Unfortunately, soap and water are not always available. Make sure your medical supplies or first aid kit include a form of waterless hand cleaner. Exam gloves come in three common types: latex, nitrile, and vinyl. Many people develop allergies to the protein found in latex. Nitrile and vinyl are much more hypoallergenic. Find out more about exam gloves. Many lay rescuers do not want to perform the rescue breathing part of CPR without a mask. The best way to avoid that squeamish feeling is to be prepared. CPR masks provide an important barrier between rescuer and patient. Blood or other potentially infectious material sprayed or splashed in the face of a rescuer can enter the mouth or nose and spread an infection. Use a face mask whenever blood or other body fluids may become airborne. Protect your eyes from injury as well as infection by obtaining the correct type of eye protection. Rescuers can choose from combination mask and eye protection that does not provide protection from injury, or they can choose more robust protection. Pick the correct eye protection for you. Contaminated sharps must be deposited into a puncture-proof container. These containers protect sanitation workers as well as other rescuers from injury. Full-body gowns are not used very often outside of the hospital. There is no good reason for this, it is just common practice across the country. Put the correct gown in your first aid kit and avoid the need to dispose of your favorite shirt or blouse. Contaminated waste should be placed into a red, bio-hazardous waste container to distinguish it from regular garbage. When working with an ambulance, it is common for the ambulance crew to allow lay rescuers to dispose of their contaminated items in the ambulance's biohazard container.